RORY McILROY WILL begin his 2017 US Masters campaign as one of the opening round’s late starters and in a group with Hideto Tanihara of Japan and in-form Spaniard Jon Rahm. McIlroy is hoping to complete a career Grand Slam by claiming victory in Augusta this week and will be in the third-last group to head out for the first round on Thursday. Shane Lowry will be part of a stellar all-European line-up that also includes Spain’s Sergio Garcia and England’s Lee Westwood. Reigning champion Danny Willett will initially be playing alongside Matt Kuchar and leading Australian amateur Curtis Luck. Other notable groups include Brandt Snedeker, Justin Rose and Jason Day, and the last to begin round one, two-time winner Bubba Watson, world number one Dustin Johnson and reigning US PGA champion Jimmy Walker. Email “Masters pairings: McIlroy to play with Rahm, Lowry part of tasty European trio”. 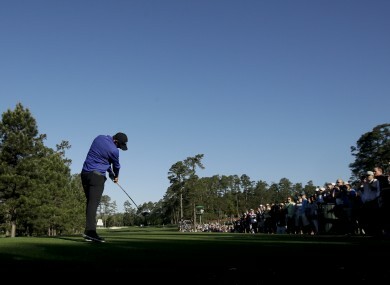 Feedback on “Masters pairings: McIlroy to play with Rahm, Lowry part of tasty European trio”.